’Tis the season to celebrate not just the holiday season, but another unveiling of a winning Indianapolis 500 driver’s sterling silver facial likeness on the Borg-Warner Trophy. Power, a 37-year-old Team Penske driver from Australia, was joined for the ceremony by three people prominent in the process: Doug Boles, Indianapolis Motor Speedway president; Michelle Collins, BorgWarner director of marketing and public relations; and William Behrends, the sculptor who created Power’s likeness that was affixed to the iconic trophy with the likeness of every Indy 500 winner. Collins did the honors of pulling away a black curtain to reveal the finished product to an eager Power. Power’s likeness is the 105th on the iconic trophy, which Collins reminded was first commissioned in 1935. The “other” Will, Behrends, has sculpted the last 29 likenesses. But it was the first time he’d made the trip from Tryon, North Carolina, to attend the unveiling. Power visited Behrends’ workshop in September and was amazed at how the sculptor completes his winners’ faces by looking at pictures. Seeing his likeness again this day, Power seemed even more impressed. “That’s incredible when you think about some of the legendary names that are on there,” Power said. “Thank you, Will. It’s an amazing image. It looks like me, so that’s good. Power concedes he’s come a long way from a being “a boy from Toowoomba,” and it took time to truly understand the importance of the Indianapolis 500. He recalled how his first visit to IMS in 2005 was kind of a pit stop while in town to be interviewed and eventually hired by Indy car owner Derrick Walker, who was among those in attendance at Wednesday’s ceremony. Power never gave his 2 cents on the oval track until he learned that a sealant was to be applied to the surface earlier this offseason. He made it clear in several conversations with Boles that he didn’t want the track to change. An offseason test reassured Power. “Hopefully we’ve left it alone so you can come back and try to defend your championship here next year in Indianapolis 500’s 103rd running,” Boles said. Power gushed with pride about how much it will mean to be able to share his signature accomplishment with his young son, Beau, two weeks shy of his second birthday. If nothing else, Power is confident Wednesday won’t be the last of his welcomed friendly reminders that he’s the reigning Indianapolis 500 winner. “There’s no place like Indianapolis,” he said. 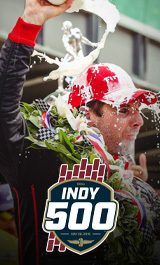 Tickets for the 103rd Indianapolis 500, the INDYCAR Grand Prix and all month of May events at Indianapolis Motor Speedway are on sale now at IMS.com. The 2019 IndyCar Series season opens March 10 with the Firestone Grand Prix of St. Petersburg.